In Australia, we are incredibly fortunate when it comes to eye health services. But for many around the world, access to clear vision is simply out of reach. ‘The World Health Organisation estimates that over 265 million people in developing countries are visually impaired and that the majority of these people have little or no access to eye care or prescription glasses,’ says Dr Rick Wolfe. ‘Poor eyesight can lead to a raft of problems, from challenges with everyday work impacting the ability to provide for a family to more serious conditions such as the onset of preventable blindness’. At VISTAeyes, we are proud supporters of Lions Recycle for Sight Australia. Since the Australian operation began in 1991, this important initiative has delivered over 7 million pairs of refurbished quality glasses to men, women and children in need across Africa, Asia, Middle East, Oceania and Europe. ‘After having laser eye surgery, our patients are no longer in need of their glasses so we simply collect these in the large glass bowl you will see in our waiting area,’ says Dr Wolfe. ‘Not only are we doing our bit to reduce landfill, but more importantly, our patients’ old glasses are refurbished by Lions Recycle for Sight members to help somebody in need get a new lease on life with proper prescription glasses’. Once the glasses are sent to Lions Recycle for Sight’s Australian headquarters in Queensland, their members do a fantastic job of refurbishing all types of glasses, whether single vision, bifocal, multifocal or sunglasses. Every pair of glasses received is cleaned, graded and labelled before being distributed to their new owners overseas. At VISTAeyes, we estimate to have collected over 6,000 pairs of glasses since we began supporting this worthy program in 2003. With the program’s annual national target of 450,000 glasses to be distributed to adults and children in developing countries every year, every pair you can spare counts. So how can you donate your unwanted specs? 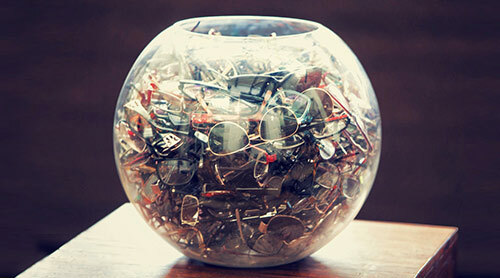 If you have any unused or unwanted glasses, simply visit us at VISTAeyes and leave them in the large glass bowl in our waiting area – and help support this important program. This entry was posted	on Friday, November 16th, 2018 at 4:40 pm	and is filed under In the News. You can follow any responses to this entry through the RSS 2.0 feed. Both comments and pings are currently closed.